Bilgin has delivered a 48.7m motor yacht which is the first in its Classic 160 series, now named M&M, that captures the look and feel of luxury yachting’s golden era. Built to RINA class and commercial standards, M&M includes the very latest technologies including zero speed stabilisers. Her displacement hull is built in steel with a bulbous bow, and her superstructure is in composite. Powered by twin 700hp MAN engines, she achieves a top speed of 15 knots and a cruising speed of 13 knots. 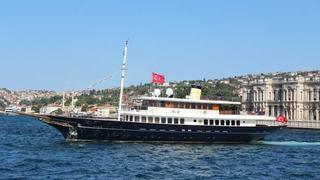 Her timeless interior accommodates 12 guests in six cabins: a master, a VIP, two doubles and two twins. On display at the upcoming Cannes Yacht Show, M&M is asking €11.5 million.